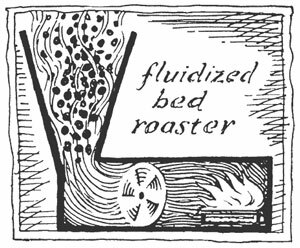 In 1982 Coffee Works was among the first roasters to adopt the “fluidized bed” roasting technology which was patented by coffee roasting legend Michael Sivetz in 1981. 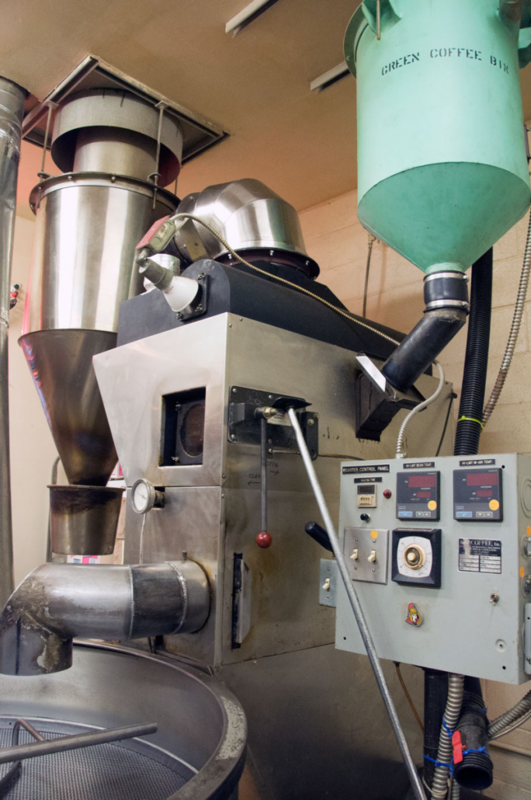 Today we are on our second Sivetz roaster, having replaced our one-third bag with a half bag model in 2002. Using ART enables us to roast coffee with optimal development of (and minimal intrusion over) the natural flavors, which has helped us to focus our cup attention on the coffee rather than the roast. The elegance of the ART design comes from the same principle underlying convection ovens: The rate of heat transfer to the bean is a factor of the speed of the heated air passing the bean surface. Higher speed heat transfer improves coffee roasting because it affords both lower roasting temperatures and shorter roasting times, both major factors in avoiding charring, the most common cause of bitterness in coffee. Shorter roasting times also result in minimized destruction of the natural volatile organic compounds (VOCs)—preserving the essential whoosh to fresh coffee flavor. Moreover, the powerful airstream (“fluidized bed”) which suspends the beans also carries away any lighter particles of dirt, dust, and chaff which are present in a natural product like raw coffee. This cleansing airstream gives Sivitz-roasted coffees their characteristically cleaner taste, free of grime and foreign matter. Roasting is one of the three fundamentals of the coffee roaster’s craft, the others being sourcing (selecting and buying) the most flavorful beans, and the epicurean art of blending coffees to create full, rich, balanced and satisfying infusions. Using a more efficient coffee roasting technology is not only a wiser use of the planet’s resources but enables higher definition of the subtle character of natural coffees, uncovering a richer palate for flavor compositions.